An engaging, community-driven experience - imagine fantasy sports meets the evening news. 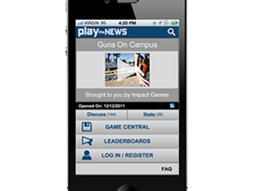 Play the News is a web-based platform that brings interactive gaming elements to the online news media industry, changing the paradigm of news consumption from passive reading to active engagement. 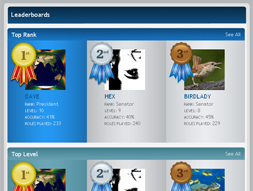 The experience is made up of the "game" component, or news games, and the community of participation around them such as commenting and player rankings and awards. The user profile allows you to build a snapshot of your socio-political profile over time on a range of issues. ImpactGames is actively looking for partners for content, syndication, sponsorship, and many other exciting possibilities. The community portal uses the creation of user profiles, activity and performance feedback, community interactions through comment threads and leaderboards, and notifications tools to increase content engagement and motivation. 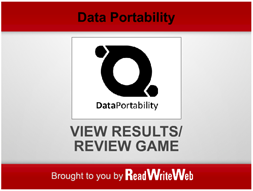 The portal tracks player and community usage and performance statistics. This community data is made publicly available as an incentive to gameplay and to instigate deeper, organic community discussions on the issues. Our templated approach to content creation for this platform allows users to create and publish interactive content with no technical skills required. Simple text inputs, image and video uploads and easy to use decision tree tools allow writers and content creators to input, preview, and publish their content. These simple interfaces extend to our portal and community management tools. Using these tools, we were able to publish, monitor, and update 127 game stories over roughly an 8 month period for our initial public beta. 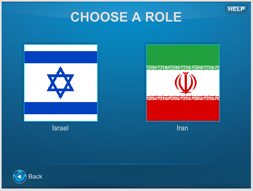 Our main interactive component consists of a role-playing scenario-based mechanic modeled after our award winning PeaceMaker gaming platform. The core of the experience combines opinion polling and prediction gaming. We are constantly exploring and working on new templates for different types of interactions and better suited for specific types of content. Our platform can easily incorporate these new models into the publishing, scoring, and stat tracking components. 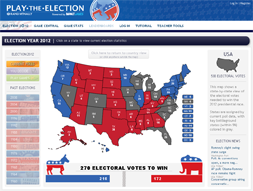 In August 2012 we were happy to partner with Rand McNally to develop a unique version of Play the News specifically focused on the United States Presidential Election. 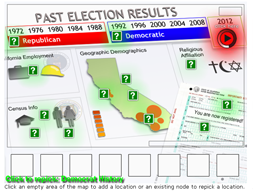 For this variation we added some unique interactions specific to the election content including an interactive electoral map as well as a multi-community system allowing the platform to support separate school or class sub-communities within the larger community. 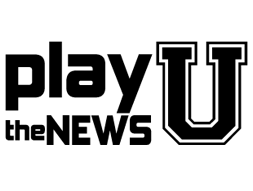 There are several reasons behind why we believe a University version of Play the News is compelling. One, we would love to have a version of the portal that is supported by separate user communities from different areas of the country (different universities) from both a player perspective but also from the content creation side. We think it would be very interesting to see how different universities would approach the same stories. Two, having worked with writers to create content for the platform we saw just how unique an experience this was. The process of constructing and following an interactive news story was a challenge for the writers and we think this experience could be very informative to the next generation of news journalists and designers as they reshape the world. We have over the years put out calls for partners ranging from traditional news content providers, to university news sites and journalism professors, to high school teachers and educators at large. We are still actively pursuing these avenues and would be happy to present to you the products, business and partnership models, and value behind them. We have worked with Missouri School Of Journalism, Rand McNally, Read Write Web and others. This, more than any of our other projects, is an ongoing endeavor. Even when we aren't visibly running a live version, we're constantly thinking about and making improvements to the core technology and platform. Items we are currently checking off the wishlist include the mobile version of the platform as well as streamlining the creation and inclusion of new game types. Check back for updates or follow the project in our Labs.